Home of the Lake County Stars! Welcome to the Lake County Stars! Lake County Stars Travel Baseball was formed in 2008 by a small group of dedicated parents. These parents wanted to create a great baseball experience with professional coaching, a focus on fundamentals and none of the politics so often found in local travel baseball clubs. Led by former professional and college players, "Stars Nation" has sent waves of well-prepared players to area high school baseball programs, dozens of players off to college baseball and helped shape the lives of hundreds of players. If status is PENDING on any fields, please check back later for changes. We will try to make the call on field status before 3 pm on weekdays and by 7 am weekends. How to determine if the field is playable: you're in the right place, just check field status on this page first! It is currently raining (and/or it has been raining) and the infield has a sheen. The infield is beginning to puddle. Walking the infield you find the footing unstable, and you’re leaving a footprint. The outfield is soggy, you're sinking in and/or the footing is unstable. Any lightening activity, leave the field and seek appropriate shelter. Continuation of play would be considered unsafe for the players and/or could damage the field as noted above. The only dry spot on the field is … well, there isn’t any dry spot on, around or near the field … time to pack it up! Click to vote now for the 2019 Stars Celebration! 2019 rosters are full, but you can still join our wait list in case a roster spot becomes available, and to be notified about future tryouts. See the guide below for how to setup your account notification settings, email addresses, adding guardians, etc. Find us via email, on Facebook, Twitter and Instagram. Download the SportsEngine App on iOS or Android devices to see your roster, schedule, and more! THE STARS ARE SHINING BRIGHT! Check out the slideshow below to see what our Shining Stars have been up to recently. To see more of our past Shining Stars, or to learn how to submit a Shining Star article of your own, check here! It's cold outside, but the Stars are heating up! The above news feed is for info applicable to the entire program. Check your team page for team specific news, or if you're looking for all Stars News, check here! 24/7/365 access to Stars fan gear. Whether you're looking for traditional t-shirts, polos, hats, outerwear and more from brands like Under Armour, Adidas & Nike, or some bling and sparkle, we've got you covered. Orders from these sources will be delivered straight to your door. No waiting for a big bulk delivery to the team that has to be sorted and distributed. Looking for an item you don't see? Prefer a different Stars logo on an item? Let us know and we will see what's available! 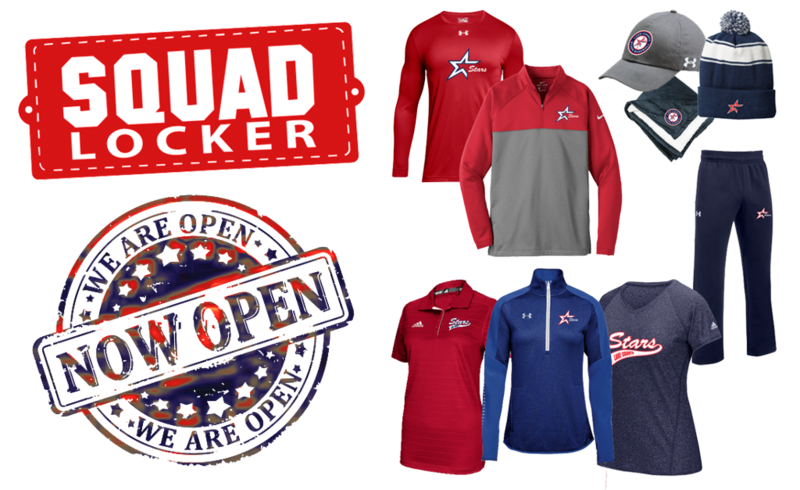 Represent the Stars with gear from SquadLocker! Get your Stars bling on with HipKraft! All returns or other help needed should be handled directly with SquadLocker or HipKraft customer service as listed on their respective web sites. However, please let the Stars know if something wasn't handled to your satisfaction. We want to be sure these options work well for you! A small portion of the proceeds from these stores is paid back to our program. Thank you for supporting the Stars! The Stars are a registered Section 501c (3) not-for-profit organization and our EIN is 46-3897724. The Stars would like to hold an event this summer for all families to get together and celebrate the 2019 season, as well as raise some money for the Stars organization. We're considering the following two events. Please check it out and vote in the poll to let us know your preference! Chicago Dogs Game - in early August we could have a Stars night at a Chicago Dogs game in Rosemont. Everyone gets a hat and there may be some on-field activities to participate in as well. If you haven't been to a Dogs game before, it's a great way to see some professional baseball up close and personal! We'd charge around $20 per person (a couple extra bucks on top of ticket prices) and raise some money for the Stars. Stars Skills Competition - we would host a skills competition in mid-late July. For our players, it would be a skills competition with pitching, hitting, fielding, running challenges, and prizes for each age division. We would setup some booths where we sell some stars swag, concessions, have a raffle, etc. Any money raised would go to the Stars. Let us know what you think of these ideas! Votes are anonymous, but you must login to your Stars account to vote. All proceeds go to the Stars for scholarship fund, field maintenance, equipment, etc. The Lake County Stars is a registered Section 501c (3) not-for-profit organization and our EIN is 46-3897724. ©2019 Lake County Stars / SportsEngine. All Rights Reserved.